Thank you to all the people who sent in catch reports. We have had such a good response we will have to save some till next week. It was very encouraging to receive reports from people we had not heard from previously. Keep them coming. Look forward to receiving more pics and reports. 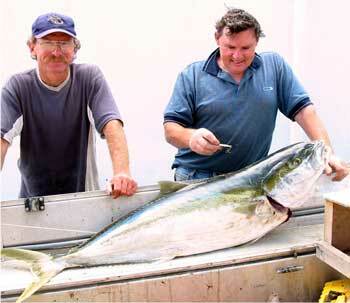 This beautiful 19.45kg kingfish was caught two weeks ago down by the river mouth. Merv Gollan and James Frings came to the beach looking to put their kite gear out but with a north easterly blowing they gave that idea away. They decided to have a play around by the river in their tinnie instead. They were trolling a 28 ounce spinning lure which the kingfish couldn't resist. Merv and James called into the shop about 4pm on Saturday with huge smiles on their faces and asked me to weigh the fish for them. The Hawkes Bay is still producing some good moki. 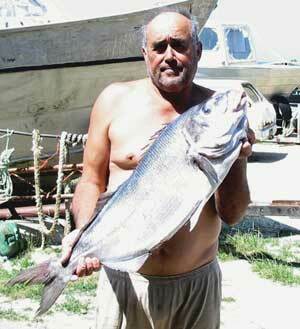 This is Nick Sciascia with a 8kg moki caught in a net off the point. The moki are starting to thin out now so anyone wanting one of these good eating fish should head our way soon. Alec McGregor was out on the beach yesterday and caught a couple of gurnard and a few kahawai. The weather today is better with around 15 knots of westerly but there was about 50 knots of wind during the night. There is a southerly change due in the next few days so now is the time to be out kite fishing. I have had reports of big schools of kingfish down off Blackhead Point. Some divers were out there last weekend and reported the kingfish were good sized fish and there were plenty of them. The big schools of snapper still haven't arrived off the coast but the season has been late for all the other species so I am hoping they are not too far away. Tarakihi are plentiful in around 12 metres of water off the southern end of the point. They are about a mile out, so handy to anyone in a boat. It is quite foul around the point so I wouldn't recommend trying to get the kite gear out there. See me in the shop if you do want to have a go at them from the beach and I will be happy to advise you where to fish. I had a successful paddle off Wattle Downs near Weymouth on the Manukau Habour recently. From two sets of the Boat Longline I caught four snapper and three kahawai. This was a great return from only ten hooks per set. All the traces I was using had one floating bead attached and no under sized fish were hooked. I was on the water at 7.00pm and spent a good two hours out on the Manukau, a very pleasant way to spend an evening. I received my new Deluxe Flexiwing Rig last Thursday and could not wait to try it out. On Saturday we went out in the heat of the day and found it very easy to setup and fly after watching Paul's Kitefishing Video. I highly recommend any other first time kitefishers to do the same. On the first set I sent out five hooks and waited about fifteen minutes. I was rewarded with my first catch, a pan sized snapper. After the first set I had to increase the weight on my float bottle by adding another, I was amazed by the power of the rig. Considering it was so easy, I decided to put out the full ten hooks on the second set. This also produced a nice pan sized snapper. The last set returned another two snapper. 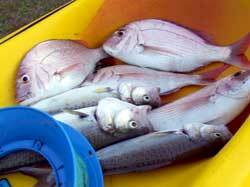 So for my first time out kite fishing I had four pan sized snapper. After many unsuccessful attempts at surfcasting I am now a kite fan. My Flexiwing Kite and Skyhook had no problem in towing out my line in the moderate southwesterly wind. I used squid for bait and the tide was coming in. An awesome way to spend a Saturday afternoon. Thank you Paul for a great product. I went out fishing in the Tiri Channel off the end of Whangaparaoa Peninsula on Waitangi Day. I set the Boat Longline out with 5/0 Target Snapper Hooks and caught nine snapper. It was very slow going and I only caught my limit after fishing for seven hours. I was using pilchards for bait and tried the area around the end of the peninsula and Tiritiri-Matangi Island. A good day to be out all the same as it was calm with a light easterly blowing. We had a great summer camp this year at Waikawau Bay, on the east coast of the Coromandel Peninsula. This was a new area for me and I was really unsure whether the beach was suitable for a bottom longline but the kids would never have forgiven me if I hadn't packed it. During the first ten days of camping we had nothing but easterlies so we were confined to fishing off rocks and dropping a longline in close from the kayaks. We had the usual January results though, caught a swag of fish and put them all back to grow to an edible size. The first sniff of a westerly saw us off to the northern end of the beach to try our luck with the Kite Longline. The wind was very light on the first set and the line stalled in the middle of paddle crab country. There were plenty of those down there. My eyes lit up though to see a nice fat kahawai when we retrieved the line to re-set it. No way was I allowed to use it for bait, as after ten days of trying the kids were gagging for a feed of fresh fish. I found enough salted mullet to bait up and this time with the breeze freshening we got the line straight out to around 800 metres. We waited for an hour and bingo, eight very edible snapper weighing between 1.0 to 1.5 kg. This attracted the attention of a number of passer-bys one of whom gave the ultimate endorsement for Paul's Fishing Kites when he commented that his camping buddy had come down in a four wheel drive towing "a big boat" with a "big outboard" and al l"the extras, cost him about eighty grand" he said. "You just caught more fish than he's caught in a fortnight." Crying on the inside I put on a straight face and proclaimed that this was just an average day for us kitefishers, whats the big deal? With the wisdom of hindsight and a great deal of snorkeling and kayaking it has become blatantly obvious to me that I absolutely fluked the only clear patch on the entire beach. There is foul everywhere you care to look, including hidden reefs that rise 20 feet off the bottom like cliff faces. I will tell you about the mussels some other time. A few days later a guy lost a complete dropper rig set around 300 metres from where I was fishing so I consider myself very fortunate to have gotten away with a feed and with my line intact. For those of you with the right gear and the experience to use it over foul, this place would have to be NIRVANA at the right time of year. I know I will be going back for more. I hope you find this info of some benefit to the site as I would be devastated if the newsletters were to stop. There was an easterly blowing about three weeks ago so my wife, Carol and I headed to Himatangi in South Taranaki. We baited up 25 hooks on the Bottom Longline and out they went. Carol was clipping the hooks on the line and must have missed a couple of crimps as we had a hook and trace left over. Not wanting to waste the opportunity of putting all 25 hooks out, I decided to clip it onto a join in the mainline at about the 800 metre mark. The rest of the hooks went out about 1200 metres. On retrieval we couldn't believe our eyes. The last hook we clipped on came in with a 4.0kg snapper! There was nothing on the other 24 hooks but we did not worry. The snapper tasted wonderful. We went out the following day and caught a nice kahawai and a red cod. The kahawai tastes great when deep fried in batter made with flour and water. The cat enjoyed the red cod. The wind was blowing straight offshore at Riversdale Beach near Masterton a couple of weeks ago. I launched the Flexiwing Kite and away it went, straight out from where I was standing. Just perfect. I set the rig around 400 metres offshore with five hooks clipped on. I had baited up using trevally and left it to fish for around 20minutes. On retrieval I found a nice gurnard on the middle hook. Great. The kite was sent out again and left to fish for 20 minutes or so, then another nice gurnard came in. The were a lot of spectators on the beach as it was a hot day. A lot of comments were made along the lines of, "I didn't know you could catch fish here" and "I have never see anyone catch fish off this beach". "My partner regularly catches kahawai, gurnard and sharks while surfcasting". Most people were impressed with the kite and several of the guys headed for home wanting to talk their wives around to the idea of kite fishing. I am heading back down to Riversdale Beach this weekend for another go.